The Washington Spirit and Seattle Reign settled for a scoreless draw on Saturday night at Maureen Hendricks Field Maryland SoccerPlex in Boyds, Maryland. The Spirit played one match prior in NWSL Week 12 action which resulted in a scoreless draw vs Sky Blue FC. The Spirit improve to 2-7-4 with the point and the Reign are 5-2-4 in league play. In the 52nd minute Reign FC had a chance to take the lead after defender Estelle Johnson conceded a penalty in the box. Reign FC forward Megan Rapinoe stepped up to take the penalty kick, but her shot was saved by Spirit goalkeeper Aubrey Bledsoe. Bledsoe earned six saves on the night and and holds a league-leading 63 saves on the year. Rapinoe was unable to convert for her side at the spot, however still leads her team in goals with five this season. The Spirit saw a spark in the first half from midfielder Rose Lavelle, who earned her first start on the night. Lavelle played 45 minutes and in the 25th minute used her pace to create an chance for the home team. At the 45 minute mark, Washington had five shots and Seattle had six. Seattle’s best chances to find the back of the net were in Rapinoe and forwards Jodie Taylor and Elizabeth Addo combining up top. Rapinoe finished the match with seven shots with three on target and Taylor and Addo finished with one shot and one on target on the night. Rapinoe and the Reign’s best final chance came in the 86th minute when defender Steph Catley played a dangerous long service into the box. Rapinoe got her head on it, but Bledsoe made a diving save to keep it scoreless. On the Spirit side, midfielder Andi Sullivan dictated the play in the middle and was able to combine well with Ashley Hatch and Estefanía Banini in the final third. Sullivan finished the match with five shots and in the 95th minute the rookie was open at the top of the box and had a chance to win it for her side, but she wasn’t able to cleanly hit the ball through and it went wide. Banini finished the match with four shots and Hatch finished with two. Reign FC goalkeeper Lydia Williams earned her fourth-straight shutout and finished the match with two saves. The Reign will next host the Courage on June 23 and the Spirit will host the Orlando Pride on June 23. Match ends, Washington Spirit 0, Seattle Reign 0. 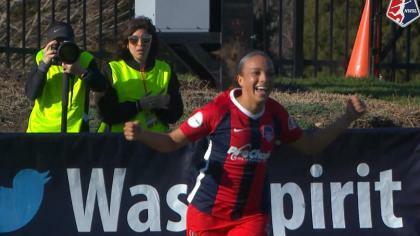 Second Half ends, Washington Spirit 0, Seattle Reign 0. Attempt missed. Andi Sullivan (Washington Spirit) right footed shot from the centre of the box is high and wide to the right. Assisted by Taylor Smith. Attempt missed. Andi Sullivan (Washington Spirit) right footed shot from the left side of the box misses to the right following a corner. Jodie Taylor (Seattle Reign) is shown the yellow card for a bad foul. Attempt missed. Francisca Ordega (Washington Spirit) right footed shot from outside the box is high and wide to the right. Assisted by Caprice Dydasco. Delay in match Rebecca Quinn (Washington Spirit) because of an injury. Attempt blocked. Jasmyne Spencer (Seattle Reign) left footed shot from the centre of the box is blocked. Corner, Seattle Reign. Conceded by Aubrey Bledsoe. Attempt saved. Megan Rapinoe (Seattle Reign) header from the centre of the box is saved in the bottom left corner. Assisted by Stephanie Catley with a cross. Attempt missed. Allie Long (Seattle Reign) header from very close range is close, but misses to the right. Assisted by Megan Rapinoe with a cross following a corner. Attempt saved. Megan Rapinoe (Seattle Reign) right footed shot from long range on the left is saved in the bottom left corner. Elizabeth Addo (Seattle Reign) wins a free kick on the left wing. Attempt saved. Jasmyne Spencer (Seattle Reign) left footed shot from outside the box is saved in the bottom right corner. Substitution, Seattle Reign. Kristen McNabb replaces Lauren Barnes because of an injury. Attempt blocked. Tori Huster (Washington Spirit) right footed shot from outside the box is blocked. Assisted by Francisca Ordega. Ashley Hatch (Washington Spirit) wins a free kick on the left wing. Offside, Washington Spirit. Tori Huster tries a through ball, but Francisca Ordega is caught offside. Attempt saved. Jodie Taylor (Seattle Reign) left footed shot from the centre of the box is saved in the centre of the goal. Assisted by Rumi Utsugi with a through ball. Attempt missed. Andi Sullivan (Washington Spirit) header from the centre of the box misses to the left. Assisted by Estefanía Banini with a cross. Attempt missed. Rumi Utsugi (Seattle Reign) left footed shot from outside the box is too high following a set piece situation. Substitution, Washington Spirit. Meggie Dougherty Howard replaces Morgan Proffitt. Rebecca Quinn (Washington Spirit) is shown the yellow card for a bad foul. Offside, Seattle Reign. Elizabeth Addo tries a through ball, but Beverly Yanez is caught offside. Attempt missed. Allie Long (Seattle Reign) right footed shot from a difficult angle on the right is high and wide to the right. Assisted by Theresa Nielsen. Attempt missed. Francisca Ordega (Washington Spirit) left footed shot from the centre of the box is high and wide to the left. Assisted by Ashley Hatch with a headed pass. Attempt blocked. Morgan Proffitt (Washington Spirit) right footed shot from outside the box is blocked. Assisted by Ashley Hatch with a headed pass. Attempt blocked. Estefanía Banini (Washington Spirit) right footed shot from outside the box is blocked. Attempt missed. Andi Sullivan (Washington Spirit) right footed shot from the centre of the box is high and wide to the right. Assisted by Taylor Smith with a cross. Penalty saved! Megan Rapinoe (Seattle Reign) fails to capitalise on this great opportunity, right footed shot saved in the bottom right corner. Penalty conceded by Estelle Johnson (Washington Spirit) with a hand ball in the penalty area. Attempt blocked. Ashley Hatch (Washington Spirit) right footed shot from the centre of the box is blocked. Assisted by Estefanía Banini. Elizabeth Addo (Seattle Reign) is shown the yellow card for a bad foul. Attempt missed. Rebecca Quinn (Washington Spirit) right footed shot from the right side of the box is close, but misses to the right. Assisted by Estefanía Banini with a cross following a corner. Second Half begins Washington Spirit 0, Seattle Reign 0. Substitution, Washington Spirit. Francisca Ordega replaces Rose Lavelle. First Half ends, Washington Spirit 0, Seattle Reign 0. Attempt missed. Megan Rapinoe (Seattle Reign) right footed shot from outside the box is too high. Assisted by Jodie Taylor. Corner, Seattle Reign. Conceded by Caprice Dydasco. Attempt missed. Tori Huster (Washington Spirit) left footed shot from the centre of the box is just a bit too high. Assisted by Ashley Hatch with a headed pass following a set piece situation. Attempt missed. Lauren Barnes (Seattle Reign) right footed shot from outside the box is high and wide to the right. Assisted by Megan Oyster following a corner. Attempt blocked. Megan Rapinoe (Seattle Reign) right footed shot from outside the box is blocked. Assisted by Stephanie Catley. Attempt saved. Ashley Hatch (Washington Spirit) right footed shot from outside the box is saved in the centre of the goal. Assisted by Estefanía Banini. Attempt missed. Rumi Utsugi (Seattle Reign) right footed shot from outside the box is too high. Assisted by Elizabeth Addo. Attempt saved. Elizabeth Addo (Seattle Reign) right footed shot from the right side of the six yard box is saved in the bottom right corner. Assisted by Megan Rapinoe. Attempt missed. Estefanía Banini (Washington Spirit) right footed shot from the right side of the box misses to the left. Assisted by Rose Lavelle. Attempt missed. 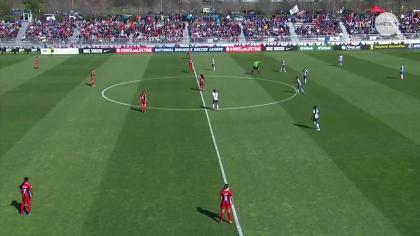 Estefanía Banini (Washington Spirit) right footed shot from outside the box misses to the left. Assisted by Tori Huster. Attempt blocked. Andi Sullivan (Washington Spirit) right footed shot from outside the box is blocked. Attempt blocked. Beverly Yanez (Seattle Reign) right footed shot from outside the box is blocked. Offside, Seattle Reign. Lauren Barnes tries a through ball, but Elizabeth Addo is caught offside.